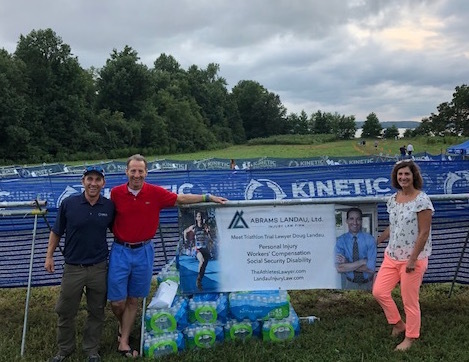 Kinetic Multisports Race Director Greg Hawkins poses with Doug & Melissa Landau next to their sponsors banner at the finish line of the Jamestown Triathlons. 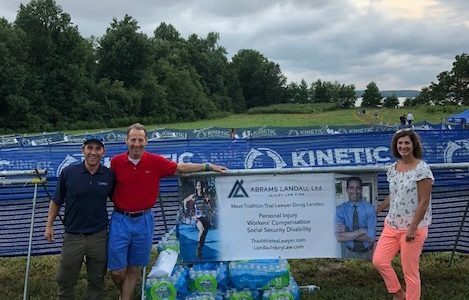 The ABRAMS LANDAU law firm has supported Hawkins and his team’s safe, fun, varied and challenging racing efforts throughout the Mid-Atlantic for many years. At the “Pre-Race Meeting” Saturday night, Race Director Greg Hawkins explained to the athletes in attendance, many of whom were first-time triathletes, that “getting hit by lightning is no fun. If there’s lightning nearby, we WILL cancel or delay the swim. If there’s lighting while you are out riding, seek safe shelter. If you are near the Finish Line, do NOT go under the tents, as they are large lightning rods. Instead, take some of the barbecue and go to your cars, vans and buses!” Despite incurring the ire of competitive triathletes in the past for making participants’ safety “Job 1,” Hawkins and his team are adamant about avoiding unnecessary electrification, injury and death. After Hawkins’ presentation, there were comments by the head USAT referee and then a “Q&A” session. The Kinetic Multisports group is so well organized that the Directors and Course Captains can be available to athletes in the days before the race for questions and emergencies. As this weekend’s races were also the site of the annual Collegiate Championships, there were large groups of young athletes from both in-state (e.g., Virginia Tech, Liberty, James Madison, University of Virginia) and out-of-state universities (e.g., Georgetown, NC State, Queens, Navy, etc.). The Jamestown Triathlon Festival was held at Jamestown Beach Event Park, located just minutes from historic Williamsburg and the College of William & Mary. Members of the William & Mary swim team even served as volunteers at packet pick up. The race site is next door to the original Jamestown Settlement. The swim takes place at beautiful, shallow Jamestown beach where you can watch Osprey catch their breakfast or see a pod of dolphins swim along the course. Also, you can stand up far from shore, which is always reassuring and adds an additional layer of safety for novice triathletes. On race day, the rain that had dominated the weather reports seemed to have abated, so there was no delay or cancellation. In fact, the water was so warm, that the race was not only to wetsuit level, but it was like bath water. Doug Landau posted a very slow swim, but felt comfortable in his skin suit and was not particularly exhausted running the long path to the first transition area. The bike course is flat, fast and parallels the Cap-Cap bike trail along Rt. 5. Landau managed to pass many of the fast swimmers biking over 22 mph on the wet roads. 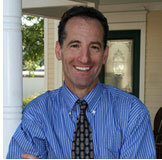 The last, short transition took lawyer Landau less than a minute before he was on the running trail, averaging 7 minutes per mile. The run course took racers through historic farmland and forest on a combination of bike paths and jogging trails. The Sprint Triathlon distances were: 750 Meter Swim; 20K Bike; and a 5K Run. For those who had injuries or chronic conditions that made running difficult, there was also an Aquabike, with the following distances on the same course: 750 Meter Swim; 20K Bike. Race categories for this race included something for everyone. There was the Half Ironman and Olympic Distance races on Saturday, and then Sunday the Sprint Triathlon (individual), Collegiate, Aquabike, Relay Teams, Clydesdale, Master’s Clydesdale, Athena, Military and Novice. All Kinetic Multisports races are quality run, USA Triathlon sanctioned events. There were volunteers all over the course, as well as USAT referees on motorcycles on the bike course enforcing safety rules and non-drafting penalties. By breaking 80 minutes, Lawyer Landau managed a podium spot, finishing in the top 20% in a stacked field full of college athletes. Landau noted once again that success in triathlons often depends on being in the right age group, as his time would have placed in younger groups! This finish will contribute more points toward the Virginia and Maryland Triathlon Super Series (VTS/MTS), where he has now completed four races in the 2018 season. There are some athletes who have finished twice that number. The Series standings are based upon points earned at each race, with an athlete’s best five races counting toward the final standings. More points are given for the longer races, the larger events and championships. As Landau is only racing the Sprint Distance this year, that means he has to be on the podium every time he races to have a chance of scoring one of the top Age Group prizes. He will be competing in the Rock Hall, Maryland and Pheasants Landing, (Spotsylvania) Virginia events in the hopes of another VTS/MTS Age Group prize. In addition, there are races planned in Bethany Beach, Delaware, Stafford, Virginia and Hagerstown, Maryland to round out the season and hopefully garner great finishes that help in the National and Regional USA Triathlon and Duathlon rankings. Stay tuned to see if Doug can salvage the 2018 season and stay healthy and uninjured.